May 31, 2018 • This week scientists demonstrated for the first time a new, highly accurate, automated way to detect clouds and their shadows from satellite images over unusually cloudy places, like tropical rainforests. This new method will make it possible to automatically generate maps of tropical deforestation or forest regrowth extending back into the 1970s; it will also allow intensified mapping coverage starting form 2015 onward. Instead of using only modern-generation Landsat imagery from the 1980s forward, scientists will now have an easier time using first-generation Landsat data from the 1970s—the earliest global imagery likely to be used for this purpose—as well as data collected by the European Space Agency’s Copernicus Sentinel-2 satellite missions staring in 2015. For decades, scientists, businesses, government agencies, universities and private organizations worldwide have relied on Landsat satellite imagery to track changes in the Earth’s forests, fields, cities, coasts and elsewhere. Landsat images were worth an estimated $2 billion to users in 2011. With the rise of cloud computing on platforms like NASA’s Earth Exchange, Norway’s SEPAL* and Google Earth Engine, the new norm is to apply algorithms to long time series of Landsat imagery. Until now, scientists have been unable to easily add older Landsat images from the 1970s or newer images from the Sentinel-2 program to these time series analyses; something they have long wanted to do to extend the data record and increase its coverage. By combining Landsat and Sentinel-2 data users can obtain images every 2-3 days instead of every 8-16 days with Landsat alone. The previous lack of good cloud-finding algorithms for the imagery acquired by the Landsat Multispectral Scanners in the 1970s and Sentinel-2 more recently, has been the limiting hurdle for the batch processing of these data using online platforms. A new cloud-detection processing method called Automatic Time-Series Analysis, or ATSA, aims to knock down this barrier. Published online this week in the journal Remote Sensing of Environment, ATSA makes automated monitoring of land cover change in the world’s cloudiest places far more reliable when using the large available archives of older and newer satellite data without thermal information. 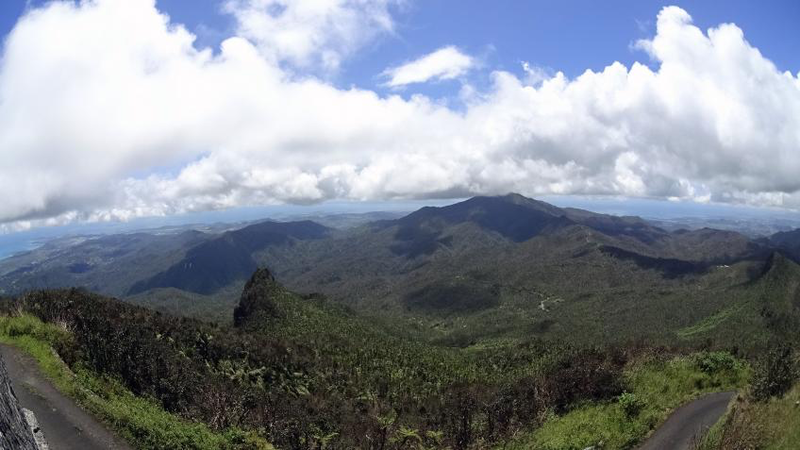 Mountaintops in El Yunque National Forest shrouded in clouds. The inability to automatically detect clouds and cloud shadows on satellite imagery collected by optical sensors without a thermal channel has long been an Achilles heel to those tracking tropical deforestation. This has especially been so in tropical rainforests known as cloud forests, which get their name because they are on mountains where much of the time they are immersed in clouds and mist. 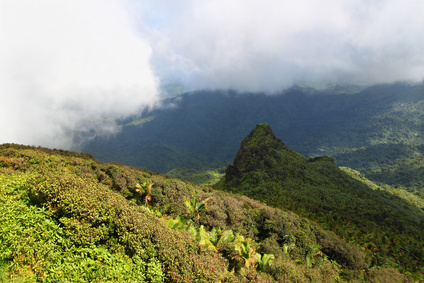 One of the study’s test sites was Puerto Rico, where the U.S. National Forest known as El Yunque has extensive cloud forests. The full importance of the new ATSA algorithm will likely come to be known over time, as scientists and others use it, and, of course, tinker with it. Zhu, Xiaolin, and Eileen H. Helmer. 2018. “An automatic method for screening clouds and cloud shadows in optical satellite image time series in cloudy regions.” Remote Sensing of Environment 214:135-153. doi: https://doi.org/10.1016/j.rse.2018.05.024. This entry is filed under Data, Ecosystems and Biodiversity, Forest Management, News.